This is a super simple, all-in-one dish that I've made a couple of times now. It involves very little effort, but tastes great and is a total family-pleaser. It's an adaptation of one I saw on MyRecipes, originally published in Southern Living Magazine. Cut sausage in half lengthwise, then into ¼” semicircles. Sauté in a large nonstick skillet over medium-high heat 8 to 10 minutes or until lightly browned. Remove sausage slices and drain on paper towels, reserving 1 tbsp of drippings in skillet. Add onion to skillet and sauté over medium-high heat until tender. Stir cornstarch into chicken broth and add to skillet, stirring to loosen browned bits from bottom of skillet. Add sausage back to pan, along with the smoked paprika, rice, and peas. Bring to a boil. When sauce starts to thicken, reduce heat to low and cook just until peas are warmed through. The original recipe called for green bell pepper instead of peas, but we don't like peppers and the peas are a perfect replacement. The smoked paprika was my addition; it goes so well with the smoked sausage. This meal is so perfect for busy weeknights because it contains ready-to-use ingredients and only takes 15-20 minutes to throw together. 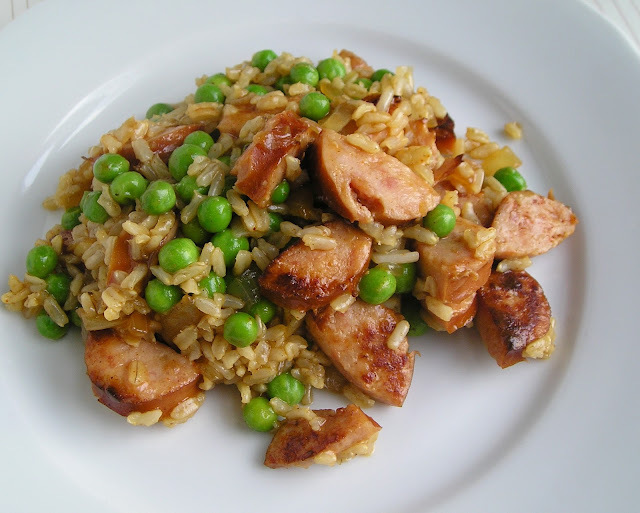 I bake brown rice earlier in the day to use in this recipe, but if you don't have time for that, you could definitely use Uncle Ben's Ready Rice or Minute Rice instead. If using Minute Rice, cover the skillet after adding the rice and let it cook the amount of time stated on the box. You might need to add a little bit extra chicken broth. What I usually do is bake a whole batch of brown rice (4 cups cooked), and then whatever I don't need, I freeze in 1 cup portions. I love having cooked brown rice on hand for adding into soups and recipes like this. A note on the number of servings: I get four servings out of this, but that's two adults and two little kids. This probably wouldn't feed four hungry adults. But it's perfect for a family of four. FYI! I love all-in-one dishes, and this one looks great. We just bought a bunch of sausage on sale, so I will be trying this recipe soon. This looks fabulous. I love smoked sausage mixed with rice. Such a lovely meal. Doing this tonight. Used the green pepper (after all it IS part of the holy trinity!). Made the baked rice, but used chicken stock instead of water to kick up the flavor. Will probably use Tony Cachere's seasoning instead of paprika. We'll see how it goes!